The United States Congress designated the Rock River Canyon Wilderness (map) in 1987 and it now has a total of 4,722 acres. All of this wilderness is located in Michigan and is managed by the Forest Service. From west to east, remote waterways Rock River and Silver Creek flow through 150-foot-deep canyons. The two canyons are separated by a broad, flat ridge and surrounded by relatively flat uplands. Second-growth northern hardwoods can be seen, alongside stumps from logging operations that denuded the area by the end of the 1930s. 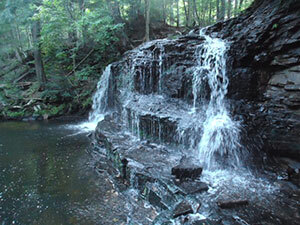 In spring, Rock River leaps about 15 feet over Rock River Falls into a pool, pouring into Ginpole Lake, a secluded 13-acre body of water bordered by canyon walls. The waters offer anglers the chance to fish for rainbow trout, brown trout, brook trout, coho salmon, and northern pike. Beyond the lake, Rock River joins Silver Creek and together they flow out of the Wilderness and continue the journey toward Lake Superior. Wildlife is typical of a northern hardwood forest, and may include deer, bear, beaver, mink, muskrat, raccoon, squirrel, hare, woodpecker, and grouse, as well as several songbirds. Access is generally easy by foot via unmarked trails covering old logging roads, skid trails, and abandoned railroad grades which crisscross the area's upland. Within the two canyons are steep walls, densely vegetated with brush and undergrowth, wet on the bottom; the fragile sandstone walls support a diversity of unique plants, and climbing is discouraged. Along the edge of the canyons, sandstone undercuts form caves up to 40 feet deep. In winter, incredible ice curtains can form when water seeps over the edge and freezes. Planning to Visit the Rock River Canyon Wilderness? How to follow the seven standard Leave No Trace principles differs in different parts of the country (desert vs. Rocky Mountains). Click on any of the principles listed below to learn more about how they apply in the Rock River Canyon Wilderness.